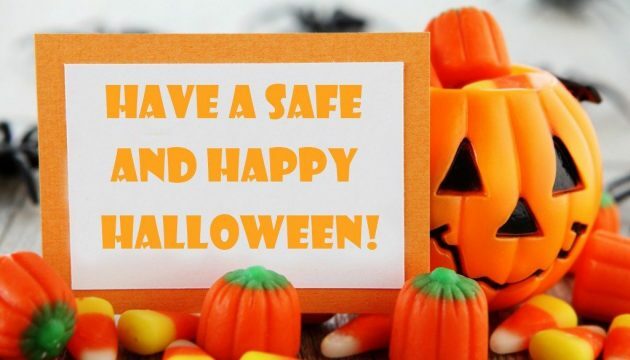 The National Highway Traffic Safety Administration & The National Safety Council remind both motorists and pedestrians to use EXTRA caution on Halloween night. Halloween is a particularly deadly night due to twice as many child pedestrians on the streets. In 2016, 107 people died on the roads on the night of October 31st, and 21 percent of those killed were pedestrians. October is the second deadliest month on the roads due to increased pedestrian traffic. Drivers should slow down and be especially alert in residential neighborhoods, enter and exit driveways and alleys carefully, and eliminate distractions so you can concentrate on the road and your surroundings. Drivers should also remember that children are very excited on Halloween and may move in unpredictable ways. We encourage parents to talk to their “goblins” about Halloween safety. Simple precautions can make it both a fun and safe night. We recommend that parents use reflective tape on their children’s Halloween costumes to provide further protection by increasing visibility. Children and parents should always walk on sidewalks or paths, and cross the street at corners using traffic signals. We wish everyone a fun, SAFE, and Happy Halloween! Signup here to be added to receive our quarterly publications Safety Sense, The Employer, and Comp Connection, as well as webinar and event invitations.